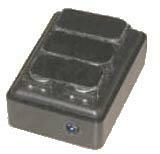 When using this GKOS IR keyboard to control audio/video equipment, no additional driver is needed. To control a PC, use this IR interface. Remote control your audio/video equipment, enter text to MiniDisc song titles, have a wireless keyboard for your PC and PDA etc. All on a single device in matchbox size. The purpose of this project is to develop PIC 16F876 software that can be used to implement a very small GKOS keyboard for a variety of devices using either a wireless infrared (IR) link or an RS232 serial port connection. Audio/video devices can be controlled directly but e.g. PCs and PDAs need to have a driver installed if COM or IrDA port is used. The result will be a dream come true: a small (e.g. matchbox size) PIC-based full-featured keyboard that you can physically design yourself, carry it always on you and use it for controlling and entering text wirelessly into PCs, PDAs, cellular terminals, home audio/video equipment etc. at a typing speed comparable to your PC QWERTY. To learn about the GKOS keyboard in general, see www.gkos.com. GKOS Keyboard - Full QWERTY capabilities with only 6 keys on the back!